Had some technical difficulties- at a conference and we don’t have wifi in the hotel (or power outlets in the auditorium…). So the Daily for yesterday was “Shadow Buster”, a remix of “Flashback”, the credits theme to Castlevania III, originally by Hidenori Maezawa. This is from the album Unchosen Paths, a rock mix album of the entire soundtrack done single-handedly by Goat over the course of about four years. By the way, the entire soundtrack is available at Goat’s Castle if you haven’t downloaded it already. 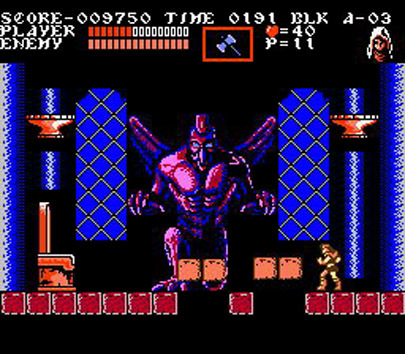 “Shadow Buster” is one of my favorite remixes from Castlevania III. As the credits theme to the game, the song is about victory and return of peace and order to Transylvania, reinforced by joyful major chords and a hummable melody. It’s got a feel of mastery over difficulty and bright skies pushing away the dark shadows. It plays over a video recalling all the levels and enemies fought, hence the original title as well as Goat’s renaming of it. The acoustic guitar that begins the track has a wonderful ethnic sound to it, which is then enhanced by the power of the rock guitar and drums and the glory of the strings. Though “Shadow Buster” follows the original version fairly closely, it does add a fantastic flute and string solo at about 0:50 and a guitar solo at 2:05. Definitely not to be missed.